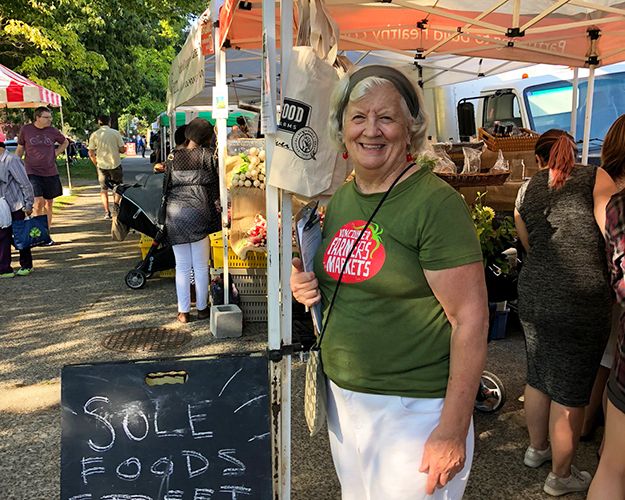 Volunteering is a great way to get involved to help develop a more sustainable food system and help create vibrant farmers markets in Vancouver! Fill out our ONLINE APPLICATION FORM and sign up to the next volunteer orientation to get started. There are a variety of opportunities to volunteer at Vancouver Farmers Markets and multiple markets to choose from. Sign-up for and attend a volunteer orientation: We host monthly orientations in the summer and on an as-needed basis in the winter. Start volunteering! Most of our volunteer opportunities are 2.5 to 3hr shifts. Once you’ve completed a volunteer orientation, you can sign-up for and confirm shifts online. Gretchen has been volunteering with VFM for over 20 years!